Welcome to this edition of the e-Book Cover Design Awards. This edition is for submissions during June, 2012. JF: Outstanding. Strong, effective and atmospheric. Perfectly suited to the subject matter, a real winner. JF: A real home run, and a cover so specific to the ebook format that it’s hard to imagine it on a paperback. The design just leaps off the page, even in the small search-results size, and keeps its humor, too. JF: Very cool, Jason, just right for this book. William C. Busch submitted Across The Battlefield designed by William C. Busch. JF: A nice illustration, and I like the colors you’ve used and the wide border, but it really bothers me that you can’t read the author’s name. JF: Nice typography combines well with the photo to produce a very pleasant cover. JF: For a cover with a lot going on, this hangs together pretty well, and the distinctive lettering gives it a unique look. Kit Foster submitted Bigger Than Jesus designed by Kit Foster. JF: Another terrific cover from Kit Foster, who tells an enticing story with just a few details and a good command of typography. Nice. JF: Stefano, I think you’re doing a great job with these covers and the others in the same vein you’ve submitted. They definitely have a journalistic feel and very strong branding from your unique style that really stands out. Patty Jansen submitted Charlotte’s Army designed by Olivia Kernot. JF: Quite a bit of visual confusion that’s not helped by the over-treated typography. JF: Nice job, Alan, your background has helped you create an arresting cover. Interesting decision you made to obscure the face of figure here. JF: I went over and looked at this full size, and still have no idea what the illustration is. That’s not good. JF: Very clean and effective. JF: Maybe too many. The density of detail might be distracting from the overall effect, but you’re not far off. JF: Nicely done, combining images like this can be difficult but here the author pulls it off. Terry Persun submitted Giver of Gifts designed by Simanson Design. JF: A sophisticated cover that, in the paperback original, shows a lot of textural detail that’s lost at this size. JF: Terrific. Also helps to show that tools and programs cannot substitute for a sense of design, which is the strongest part of this admirable cover. JF: Nicely done, and I like the unique border. Kelly Marino submitted Into The Hourglass designed by Kelly Marino. JF: It’s working, this one was instantly recognizable as part of the series. JF: Running type over a beautiful woman’s face is not something I would usually advise, but it works well here and the effect is intriguing. 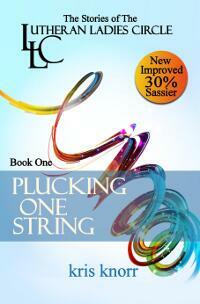 Morning West Publishing submitted Lutheran Ladies’ Circle: Plucking One String designed by Joleene Naylor. JF: Many of these elements are at war with each other, and none of them dominate, leading to a confusing cover with no clear eye-path. JF: To really establish the “brand” of this series you might think about standardizing the typefaces you’re using. Kit Foster submitted Maple Express designed by Kit Foster. JF: Fits the genre nicely. JF: You can’t get a “fresh and vibrant feel” using mismatched and tired clip art, and it needs a border of some kind to keep from “bleeding” onto the white page. JF: Not sure it works as well for ebooks as it did for those pulp paperbacks. Just too much going on, but solid typography holds it together. JF: You’re almost there, but the little, ornate type isn’t doing a good job. You might try this with the title about twice the size and experiment with the font, too. Lovely illustration. JF: Professional designers know that restraint is a great tool to create the impact they want. Here the author, who is also a designer, combines all the same elements we often see on these covers, but with such finesse that the result is both dynamic and atmospheric. Beautiful. Lisa Nowak submitted Running Wide Open designed by Robin Ludwig. Donna Hosie submitted Searching for Arthur designed by Design for Writers. JF: Adept use of the Charlemagne typeface and careful construction of this cover set it apart. JF: You did fine. Despite an interesting design, this cover is held back by a somewhat dull palette. JF: Looks like your inner Van Gogh nailed it, Matt. JF: This interesting graphic would be better served by stronger typography. JF: Excellent job, this cover has a lot going for it including the careful typography and arresting image. Laxmi Hariharan submitted The Destiny of Shaitan designed by Peter Ratcliffe. JF: A fantastic cover for an indie book, really first-rate. Glad to see more work from the crowd at 99designs.com in the competition. JF: Okay, it definitely stops you, no doubt about that. Then there’s the whole dissonance thing we you see it’s “love poems.” This anti-genre move might work, or it might be the symbolism thing. Veronika Licakova submitted The not so secret emails of Coco Pinchard designed by Veronika Licakova. JF: Love it, particularly the duct tape. Clever and appealing. JF: Like The Final Testament, just above, this cover gives up too much to the image, and loses balance. Ideally you’re looking for an integrated message, and in these cases the image takes over. Thomas A. Knight submitted The Time Weaver designed by Claire Stratford. JF: Beautiful simplicity and balance. A unique look. Claudia Carozza submitted The Twenty designed by Robyn Platoni. JF: Okay, so admit it: you also noticed there were 27 figures on this cover? Marvin Rondares submitted The Warriors: Ep. #01.01 “The First and Last Time” designed by Marvin Rondares. Kit Foster submitted The Will of the Gods designed by Kit Foster. JF: Compare this cover to the one immediately above it, The Warriors. Both have a title, sub- or series title, author’s name and an image. One is confused, illegible and indistinct. Here, Kit Foster shows how strong typography, a carefully controlled palette, appropriate illustration and the knowledge of how to control the reader’s attention combine to make a standout cover. JF: Great job, I especially liked the overlaid filigree, a lovely touch. JF: Looks like you’ve got a great future ahead of you. Hard to find anything to criticize here, but I’d love to see it with the title in white or at least a whole lot lighter to create a “high key” for the cover in exactly the place you want to lead the reader. Jordan Castillo Price submitted Turbulence 1: Into the Bermuda Triangle designed by Jordan Castillo Price. JF: Very cool and effective. Benedict Beaumont submitted A Last Chance Powerdrive designed by Peter Woolf. JF: The illustrator is an accomplished artist and children’s book illustrator. And this image makes a terrific cover. The larger example on Amazon is brighter than the version you see here. JF: A strong nonfiction cover achieved through confident typography and the discipline of a 2-color design. Ulrich submitted Gehirn-Glühen designed by Herman Zeichen. Terry Persun submitted Guidebook for Working with Small Independent Publishers designed by Renda Dodge. Leon M. Hielkema submitted HR Strategic Project Management SPOMP designed by Joii, A. Breeuwsma. Jennifer Brozek submitted Industry Talk: An Insider’s Look at Writing RPGs and Editing Anthologies designed by Ivan Ewert. JF: A clean and attractive design for an industry-specific book. Mindy Levy submitted Mindy’s Musings designed by Mindy Levy. JF: Mindy, there’s something very charming about this book cover, but it needs better and stronger type to really make it sing. Kit Foster submitted More Podcast Money designed by Kit Foster. Nancy Hendrickson submitted Pinterest: Build Your Brand, Your Tribe, Your Sales designed by Nancy Hendrickson. Did you receive my submission for the book cover award of my novel I, the Provocateur? I love looking at these covers and learn a great deal from your comments since I plan to create my own covers. I especially like when you compare two covers–it gives me that “ah-ha” moment. And I have to add that authors who whine about your comments really need to develop a thick skin, shut up, and learn from their mistakes. I really enjoyed looking at all the book cover designs. Some caught my eye right away while others drew me in and got me to thinking about the content. Joel, again thanks for doing the analysis on all the great covers. New things for us to strive for every month. Over on ‘Dear Author’ they run a ‘first page’ feature where authors load in the first page of approx 600 words and the readers make comments. I think you have enough traffic that you could run a sub-page this way. That way we can get feedback before hitting the ‘publish’ button. Other readers do many of the comments so you are mostly a moderator to cut your work load. Just a thought. Again, thanks for your monthly column here. Love these awards. Some stunning covers. I’m teetering on the edge of self-publication so am finding all of the info here very helpful. Much appreciated. Apparently you don’t know what my book is about because if you did you’d know better than to claim it lacks these elements. We clearly have different knowledge of how people see images and what “carefully controlled palette,” “appropriate” and “standout” mean. You also hurl unnecessary insults by calling my work “confused, illegible and indistinct.” While it may be slightly illegible it is hardly confused and indistinct. The only confusing thing is your unwillingness to constructively criticize all entries and the only thing indistinct is your “cover contest” that seemingly picks monthly winners almost at random or whatever is or has been a trend. Although, I could very well be wrong as I have no idea how you run your operation. I did not submit my work as fodder for your critique of someone else’s work. Thank you for your time, but I will not be patronizing your site anymore. I’m sorry you feel that way, Marvin. The posts and critiques are meant to be educational. Having looked at the post again, I stand by my comments, and thanks for participating. Thanks for the advice on Tea in the Afternoon. I appreciate it and will work on the typography. This is a great service. I’m learning a lot from it. Joel – Thanks for doing this! In the library the other day I was realizing once again how important covers and titles are – I was picking new arrivals off the shelf purely on their title on the spine and then a quick look at the cover before taking the time to read the blurb. It’s amazing how traditionally published authors have little or no control over these things, and it is something that appeals to me about publishing independently. It is interesting to see a bunch of indie covers all gathered in the same place and there is a lot to learn from discussion and analysis. Something publishing houses I imagine do inside, of course, so thanks for providing this for authors working independently! Thrall, The Dirty Secret, The Black God’s War, and Riding for the Stars stood out for me in particular.You’re right, that often the typography is so important! And Gemma – Beautiful artwork that really seems to capture what you describe for the book. I’m sure you can design a title with bigger font that fits the artwork. Your monthly covers are one of the high points of each month for me! It strikes me that the overall quality seems to be improving…there are severally really fine examples in this month’s selection. More control over type and more purposeful colors. I thought Stomp: Strategic Project Management was especially fine and appropriate. Thanks for recognizing quality design and helping raise the bar. Thanks, Roger. I had exactly the same thought when I was reviewing the covers this month. Also there are more covers that are obviously or uniquely ebook covers, which seems exactly right. It’s fascinating watching designers adapt so creatively. Is this an iPad thing or are half the covers in the wrong places from about half way down the list? It must be an iPad thing, everything looks fine from here. I’m a bit disappointed with what happened to my cover after reducing on your blog – it doesn’t look as bad on amazon or on the thumbnail on my website. I will make sure not to link a too large image next time. Part of the difficulty with the image is the abundance of very fine detail, and that can make it harder to reproduce, especially at small sizes. Can someone please provide a link that works to 99designs.com? I would like to find out more about it, but both http://99designs.com and http://www.99designs.com lead me to a placeholder page that makes it look like that domain hasn’t been claimed. Help? Thanks, Joel (and Kit!) for the comments about Plaguewalker. You’re absolutely right, of course. It was pure ego making the type too small. I didn’t want to cover up my pretty picture 🙂 Thank you again for doing this. It’s such a great way to learn and to see my work from other, unbiased perspectives. Thank you so much for the honor of winning the nonfiction cover award with Giving The Bird. I appreciate the comments and being a part of the monthly book cover design contest. I love that you are doing this and helping authors understand the great importance of a good solid cover with strong type design. What you point out in covers is exactly what I try to share with my authors when I do their covers. I love doing cover design and taking on the great challenge of communicating a story in such a small format. Thank you for taking the time to do this. I plan on submitting many more. Sure, Patty, great job. I look forward to seeing more of your work, thanks for participating. I love your cover issue and learn a great deal from the comments. Thanks! Another highly interesting month! Thanks again Joel – I’m honoured to be included in the contest again. My personal favourites this month are: Giver of Gifts (I’d love to see this one in print), Plaguewalker (although, you’re right, bigger, clearer typography would have transformed this from a good cover to a great cover), Still Life in Red, The Dirty Secret and Adopted Reality. And the winners, of course, are both excellent. Thanks again Joel, for all of your time and effort – and for all the helpful comments! And thanks for continuing to submit your covers, Kit, I love to see what you come up with, it’s always interesting. Kit’s comment points up a problem with the Adapted Reality cover. He wrote Adopted Reality–the type face isn’t quite readable enough, and it was an easy mis-read.